Earlier in the week, I wrote about local meat purveyor Wellshire Farms, which produces gluten-free cold cuts and other delicacies. In addition to offering a gluten-free menu, the management at Marmont Steakhouse in Old City (222 Market St., 215-923-1100) recently added an electric fryer used only to prepare frites (avoiding cross-contamination with glutenous fried items) along with Redbridge beer. Crème brûlée is available for dessert. Although not new to the restaurant list, Joe's Crab Shack (locally in Lawrenceville and Wilmington) has listed all of its gluten-free items on a dedicated menu. The Pie Lady Cafe in Moorestown (9 E. Main St., 856-778-PIES) can make any of its pies gluten-free by special order. 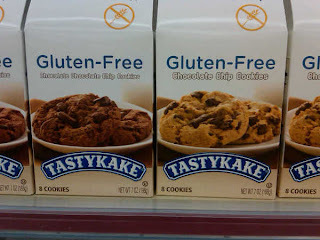 The bakery bakes the gluten-free versions - with tapioca and coconut flours - separately. Thanks to reader Diana M. for the heads-up. Back in January, I featured Snack Like a Local, a local company looking to offer healthier options - including gluten-free snacks - in area vending machines. The company just announced that it will be placing its first machine in Old City at Independents Hall, a coworking space and community. 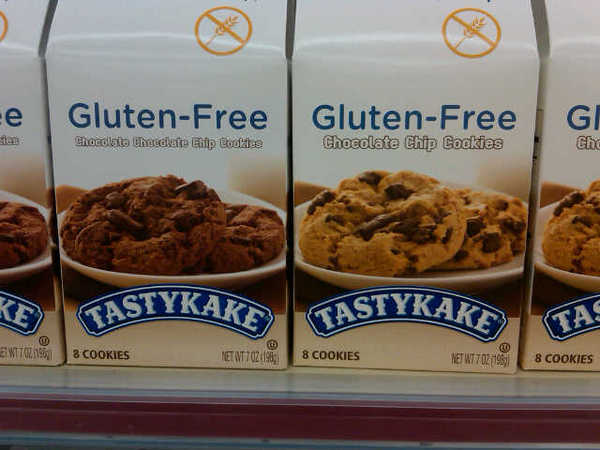 Wegmans will carry new muffins and cupcakes from Doylestown's allergen-friendly Cookies . . . for Me? They can be found in the frozen-foods section and the bakery. I'm happy to report that DeLiteful Foods in Lawrenceville, which was scheduled to close at the end of March, will remain open under new ownership. Another barrier broken: Eco-Planet is coming out with gluten-free Pop-Tart-style toaster pastries, in Frosted Blueberry, Frosted Strawberry and Frosted Brown Sugar & Cinnamon flavors. Thanks to Gluten-Free Optimist Sandra, who directed me to a blog post up at Nicole's Special Diet Creations. I plan to be off the posting beat next week, but will return in the beginning of April. Keep your restaurant and product tips coming to me via email, or post them at Facebook. For those of you planning to attend the CHOP Education Day on Sunday, please say hello. Michael, it would be a huge help to those who are either new to this area or just visiting if you included "PA" or "NJ" or "DE" after the cities you mention. There are so many things in this column that I'd like to track down, but I don't even know which state to start in! Also, if you could include the street addresses in the sidebar listings on your map, I would be so grateful, and I'm sure others would be, too. Now when I print out the map pages, I have to manually write down the exact addresses on it. 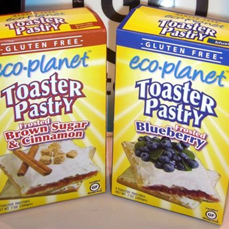 Loved to hear about the Eco-Planet gluten-free toaster pastries!